How to remove Set Attributes Step in New Change Task wizard? I need to customize change notice creation wizard. In the "Define Implementation Plan" step I have default change task. When user click for edit change task the system open subwizard "New Change Task". In this subwizard I want to remove "Set Attributes" step. How can I do it? 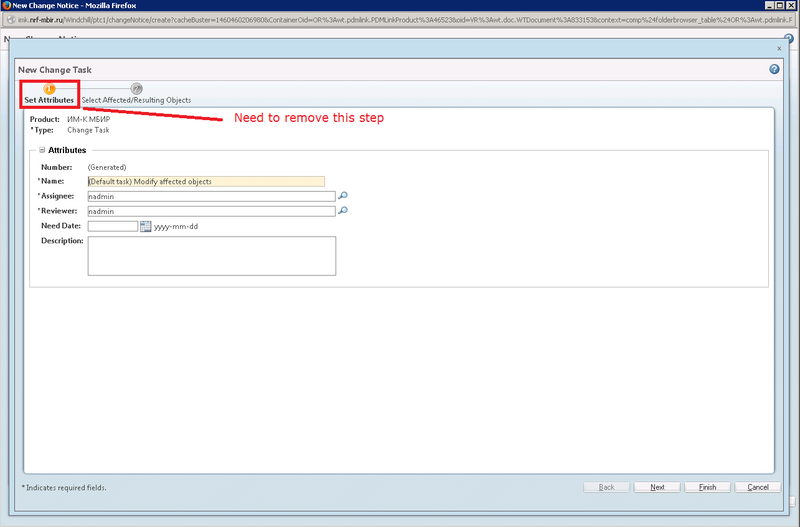 Re: How to remove Set Attributes Step in New Change Task wizard? I tried this solution and it worked but at the same time it prevent creation of Change Task at the second step of new ChangeOrder2 creation. Also I tried to hide Attribute tab step when editing ChangeTask (commented similar section of edit.jsp in the same folder) and Windchill doesn't save changes in ChangeTask. So, this is not appropriate solution for solving this issue.